Beneath its smooth, padded top, this sand-free mat uses military-grade technology to give you a clean surface at picnics, tailgates, and beach trips. Its dual-mesh weave lets particles fall right through and even keeps dirt and sand underneath from coming back up. The army uses it to launch helicopters, but we recommend it for anything from soccer games to sunbathing. Dimensions: Folded: 20" x 11.2" x 2"; Expanded: 3'4" x 6'6" x 0.25"
Works well at beaches and my husband uses it every time he goes to the beach. Held up to wind and sand wonderfully. A little heavy to carry, but worth it. Land on a clean, sand-free mat that uses the same technology as military helicopter launch pads. 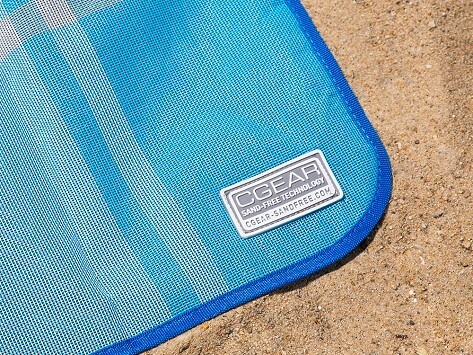 Secure a dirt-free surface for picnics, tailgates, camping, and beach trips. This mat’s patented dual-layered mesh works like quicksand, sifting sand through but also keeping it from coming back up. Before setting out to improve your sunbathing experience, the Makers at CGear wanted to reduce the hazardous dust clouds that form during helicopter takeoff and landing. Their military-grade design was then adapted for less high-profile activities. 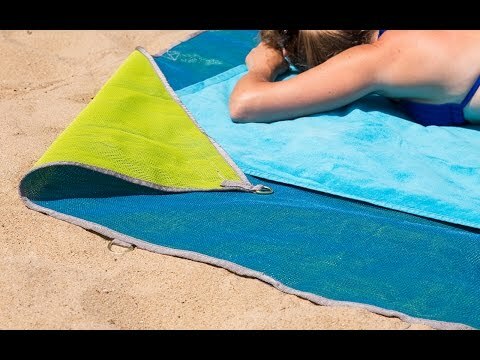 The quicksand mat has padding on top, making it comfortable to hang out on the beach or anywhere else. The utility version is more like a tarp, with rings on it that you can stake into the ground. If you’ll be sitting on it, we suggest you put a towel or blanket on top to add some cushioning. Whether you’re trying to enjoy a picnic on the beach or watch fireworks in the park, enjoy the outdoors without getting it all over yourself.